Editor’s note: Below is a wonderfully precise entry on Mosel wines by André L. Simon in the Fourteenth Edition of the Encyclopedia Britannica, Volume 15 (1929). I found this in the Internet Archive (archive.org). The original text doesn't include umlauts (Grünhaus) and other diacritics (Trèves). Moselle Wines. The vineyards of the Moselle are of greater antiquity than those of the Rhine; they were originally planted by the Romans at a time when the Rhine was the boundary of the Roman empire. It is only from Treves to Coblenz that the vineyards of the Moselle produce white wines of truly great distinction, exceptionally fine bouquet and sufficient merit to command abroad much higher prices than local consumers are willing or able to pay. Under the name Moselle are included not only the wines from the vineyards on both banks of the Moselle from Treves to Coblenz, but also those from the vineyards of the Saar and Ruwer, two tributaries of the Moselle. The Saar joins the Moselle a few miles above Treves; its finest vineyards are those of Scharzhofberg, Bockstein, Geisberg and Euchariusberg; very fine wines are also made at Scharzberg, Agritiusberg, Wiltingen and Oberemmel. In the valley of the Ruwer, a small river which joins the Moselle below Treves, some very delicate and fascinating, white wines are made, none better nor better known than those from the ancient ecclesiastical vineyards at Grunhaus. From there to Coblenz, upon either bank of the Moselle, are grown the finest wines of the Moselle proper. To name but a few: Piesport and Brauneberg, on the left bank of the river, Bernkastel, further north, on the opposite bank, and from thence northwards the vineyards of Graach, Wehlen, Zeltingen and Trarbach, on the right, and those of Erden, Machern and Urzig, on the left, are among those which produce the most delicate Moselles, wines which are light, pleasantly dry, and possessing a “bouquet” which is as distinctive as it is charming. 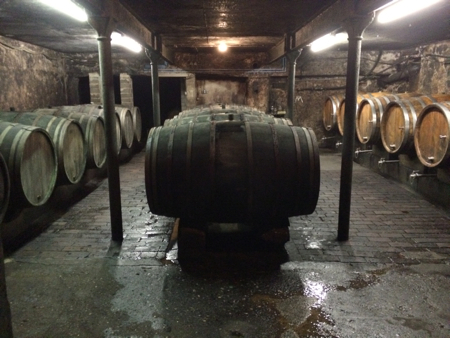 A photo of the cellar at Egon Müller – Scharzhof. Very interesting to see Machern included. I don’t recall seeing that area ranked very highly in many of the other 19th and early 20th century classifications, either official or informal. No doubt, Markus Molitor would be pleased to see this, since the Wehlener Klosterberg still continues to be fairly unknown (at least in the United States). Thanks for highlighting this. I’m looking at the old Tranchot map of Machern (1811). The part of the hillside that was first planted to vines is now covered, for the most part, in scrub—namely, the present-day Wehlener Abtei. The Abtei, or abbey, vineyard rises directly behind Kloster Machern, a former Cistercian monastery. Nonetheless, Wehlener Klosterberg is an underrated site, and Markus Molitor seems to have expanded his holdings with new plantings on this predominantly south-facing side-valley site. This morning, I looked at the Clotten map from 1868, and Wehlener Klosterberg wasn’t even planted then. The 1906 edition shows a new planting on Klosterberg but not above Haus Klosterberg. The Machernberg (today’s Wehlener Abtei), facing the Mosel River, was covered in vines. The title of the last book in André L. Simon’s bibliography was probably wrong, and should have been A Book of Other Wines Than French, published in 1929. In the chapter on Germany (29 pages), P. Morton Shand (1888–1960), demonstrates a deep knowledge of its wines. The subsection therein “The Moselle, Saar, and Ruwer Valleys” (five pages), is one of the best texts I have ever read on the topic.